I was at the office today (our local park) doing a consultation with a man and his Labrador, working on recall and loose lead walking (connection). We have a really nice community at the park on weekday mornings, the professional dog walkers, the power walkers without dogs, the recreational cyclists and the dog people walking their own dogs. There is a fella who I see who has two GSDs who he has trained to a high level from the brief glimpses I get of him (I see him several times over the month). He appears to use positive trainng methods from what I can see. He uses food to reinforce the behaviour which he likes and I’ve never seen him physically correct his dogs. When he asks the dogs to do something though, he’s not really asking, he’s telling. This fella knows I’m a dog trainer and from reading his body language (he never says hello to anyone etc) I get the impression that’s he is trying to show me how it’s really done. Today (and every other dog he sees me), he put his dogs in a sit stay in the middle of the path and walked away. There were other dogs and people around walking past his dogs. The dogs were transfixed by him and then he called them, they raced towards him and then held a heel position targeting his hands for about 50m or so. They were then reinforced with food. Impressive? Yes, maybe. Ethical? I’m not so sure. If this had been in competition for a dog sport, then yes, it’s impressive. If it had been in preparation for that dog sport competition, then yes, cool also. My issues is that it’s done for the benefit of all those watching and at the dogs’ expense to boot. Training with positive methods isn’t enough. We need to train with an ethical mindset too. Too much of a good thing can be a bad thing. Until next time, have a great Christmas. Guest blog from Lindsay Docherty. Lindsay first came to me as a client a few years ago with Millie. Since then she has been studying both with the IMDT, and with Clare Russell and myself. She has been doing some work for me over the last few months. Living with a dog in pain. Living with a dog with a chronic pain condition can be difficult. There are two types of dogs, those who will suffer through the pain without any change in behaviour and those who suddenly feel under threat from their world.. The change in behaviour can range from a slight reluctance to perform tasks to the drastic who’s behaviour can change completely. We currently have a dog who falls under the last category. Millie is our 6 year old rescue dog. At the young age of 1 year old she had a bad fall and suffered internal injuries similar to those of a high speed impact in a car. Collapsed lung, bruised heart and a torn liver not to mention a huge amount of muscle damage. Our happy friendly pup was now on a long journey of pain management and behaviour change. The changes didn’t happen over night. As her world suddenly became filled with danger and potential hurt to her she modified her behaviour to try and control it. Previously she was every dogs friend and used to love nothing more than a full on sparring session. This was now her idea of a nightmare. Her “friend” dogs were suddenly hurting her. In her mind it wasn’t that she was experiencing discomfort and the other dogs happened to be there it was the dogs themselves that were hurting her. She’s now really sensitive to changes in her environment. A break in her routine unsettles her and can last for days. People approaching her in the street spooks her. Visitors to the house is really difficult as she doesn’t want to be touched and that’s what most people want to do with a dog. When travelling in the car she won’t lie down if she’s having bad pain day. After a year and a half on and off medication and us making pretty much every training mistake you can during that time the pain had eased off enough to begin behaviour modification training. Us learning the right approach to take and how to make her feel safe were the first steps. She’s predictably unpredictable so if we work with the thinking that she’s going to react to everything we can set up the environment to help her make the right choice even in the toughest of situations. As a puppy Millie was Mrs sociable though still a bit nervous around dogs that were quite full on. After the fall the pain made her completely change in these situations and rather than removing herself she would lunge and bark and tried to get on top of the dogs that she was afraid of. In fight or flight terms she was definitely using the fight method to get the dogs to go away. 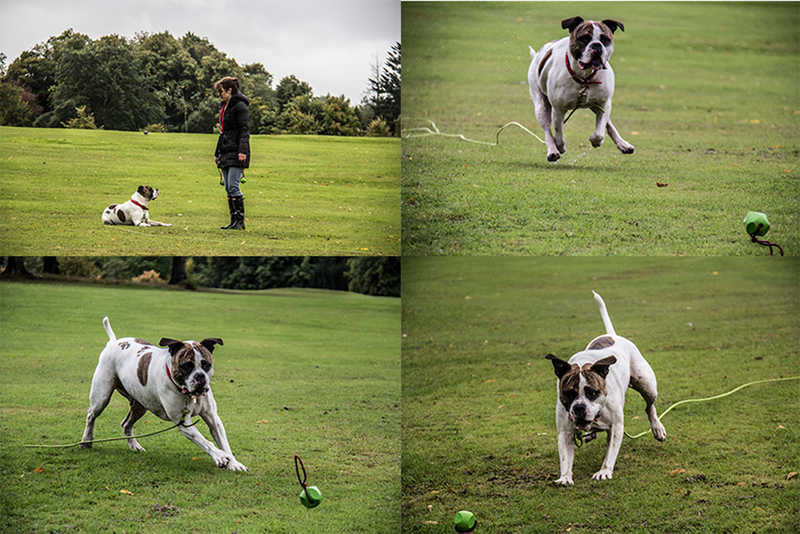 Luckily she never progressed any further than a lunge and a bark. Our initial goal was teaching her to remove herself from situations around other dogs that she previously would have reacted to and helping her when she couldn’t do it on her own. 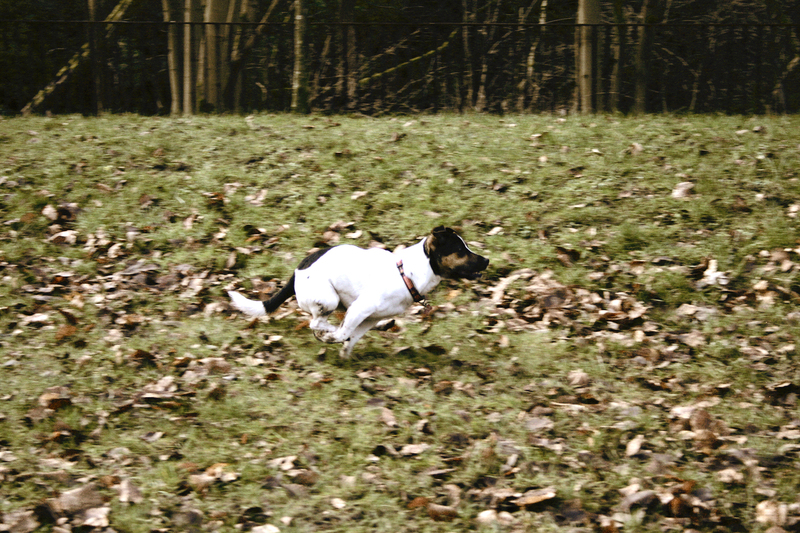 Millie likes to control her own environment and the movement of dogs within it. We haven’t stopped her from doing this but instead heavily reinforced lower intensity behaviours. If she doesn’t want a young bouncy dog to jump on her that’s fair enough so strong eye contact with the dog or a low grumble are far better than a full on lunge, bark and pinning the dog to the ground. We have to come up with a compromise with her where she can keep herself feeling in control and more importantly not be hurt but also that the other dogs we meet are kept safe. We spent a long time teaching her avoidance before we let her start meeting other dogs. Only through persistence with the avoidance training and setting this up as the primary behaviour to perform around dogs were we sure that if she felt unsafe she would disengage and come to us for reinforcement for doing so rather than feeling she had to deal with the situation on her own. If she isn’t happy with a dog’s presence and the dog doesn’t leave we ask her to come with us and we will take her away to a distance she feels safe whilst heavily reinforcing the moving away. She’s now at the stage where she is able to make some pretty amazing choices in previously highly reactive situations. This can however change depending on the intensity of her pain from day to day. If she’s having a bad day we take a few steps back and ask her what’s the best behaviour she can give us that day and work with that. Doing so she learns that we can ask her how she’s feeling that day and we won’t put pressure on her to give more than she can. Something as simple as lying down in the front of car is too much for her some days. If we ask her to lie down and she doesn’t after a couple of requests we don’t get mad. She isn’t disobeying us she just simply can’t do it at that time. As well as being on the initial stage of my dog trainer journey I am also a part time dog walker. Knowing Millie and how she feels about strange dogs I was able to introduce her to the new dogs whilst keeping her feeling safe around them and I’m happy to say that she now has a bunch of great K9 friends that she can run, play and wrestle with when we are out on our walks. The first time she initiated play with one of the dogs I was I was in floods of tears whilst trying to video it! A real turning point for us as it had been 3 years since she had initiated play with a dog other than the other dog in our house Leo. Living with a dog in pain isn’t easy. It’s a full time job especially if they are reactive. We are very lucky in that our good days are so good they make up for all the bad times. We love our girl, and by understanding her body language and what she needs from us to be successful, help to build the dog and owner bond every day. Workshop 5 of 6 today. When we started Positively Excellent Dog Training a few months ago, Clare and I envisioned bringing quality, up to date dog training to both trainers and owners in a way which was easy to access and understand. It has been a massicvve success and is just the start of things to come. Today we looked at behaviours, skills and outcomes. Behaviours can be described as a specific thing the learner does, such as moving a cetain muscle or joint. Skills are where the dog generalises, so “walk beside me” can mean in a varietyof situations for example. A skill humans would have in this example would be having the skill to open most doors of similar design once the skill of door opening is learned. Some doors open by pulling, others by pushing (depending where you are in relation to it). Once the skill of door opening is learned, we can then apply it to many situations. The outcome for us would be the open door, the outcome in the dog example would be the dog walking with you on a loose lead. Students had to teach me how to open a door when I was at the other side of the room. They were asked to break down each behaviour into very small steps. Each time they asked me to do something I wasn’t in a position to do, I told them I couldn’t do it and then they had to break it down further. This extended to putting my weight on one foot rather than the other, moving a specific distance forward etc. All these things teach us to be very careful in what we are describing and reinforcing, if the learned jumps ahead of us then we can go with it. If they get stuck then we need to break it down further into something they can do. We then looked a little more closely at certain drivers for reinforcement. Can we mimic the hunt for a dog and then put this on cue so the dog gets to hunt but only when we ask for it? Can we mimic a sheep’s movment with a ball so that a collie can herd the ball, give him an outlet for that daily and put it on cue so we get less herding of people and traffic? The answer is yes, we can. Next workshop is the 4th June in East Kilbride. The only two questions we need to ask in dog training. Sorry it’s been a while since my last blog. I asked a question on my Facebook page the other day. (https://www.facebook.com/pages/Glasgow-Dog-Trainer-and-Behaviour-Consultant/137403276291620?ref=hl) What is the single biggest issue you have with your dog? On looking through the answers, there was a common theme about trying to eliminate unwanted behaviours. I’ll address some of the issues as best as I can. When dealing with any dog behaviour/training issue, it’s always absolutely essential that we have at least a basic understanding of reinforcement. Reinforcement simply means that the behaviour is likely to reoccur. If behaviours are reinforced, they will continue. If they aren’t reinforced they won’t. Here I’m only going to address reinforcement. Punishment (the scientific term) is the is about reducing behaviour. Behaviours which are not reinforced will go away. If the dog continues to do the behaviour you don’t want, he is still being reinforced on some level for doing that behaviour, or has a sufficiently long reinforcement history for that behaviour that he’ll continue to keep doing it, with the hope of accessing reinforcement. If your dog doesn’t have access to reinforcers, he can’t be reinforced for the behaviour which allows him access to it. If the behaviour isn’t reinforced, your dog will stop the behaviour. This may take time, depending on your dog’s history of being reinforced for that behaviour. One of the sometimes frustrating rules of learning is that behaviours which are randomly reinforced, are resistant to extinction i.e they won’t go away. Think of it like a fruit machine at a casino. They pay out randomly to keep you playing. So if your dog has had a history of being reinforced for jumping on people, and you now try to stop it, but your dog is successful on average one time in fifty, this may be enough to motivate your dog to keep trying because sometimes it pays off. Sometimes dogs will work for one chance in twenty, others one time in one hundred, it depends on the dog. So, to address some of the issues which came up. These are general points designed to illustrate principles of learning and aren’t exhaustive. 1. Jumping. Dogs find attention reinforcing. When a dog jumps, people will generally talk to (shout at), touch (pull) and look at the dog or a combination of the three. The three things which have occurred, are reinforcing to the dog, he now knows jumping gets a reaction and will do it again the next time. If you are still doing these things time and again, and your dog is still jumping up on people, what you are doing isn’t working and we need to try something else. Dogs I work with often jump on me on greeting them the first time. The client generally does a combination of the above. The first thing I ask them to do is just to ignore the dog. If the dog is on leash, I talk a step back, so I’m out of range (the dog can’t touch me) I don’t give eye contact and the dog isn’t reinforced. As soon as the dog stops jumping, or trying to jump on me, I reinforce the “four on the floor” with attention, praise, treats etc. The other technique I use very often is to stand on the leash. I use 6′ leashes for training. This is a good length for a number of things. What it allows me to do here is to drop the leash towards the ground while still holding it in a relaxed manner, and stand on it. I’m not pinning the dog to the ground here, there is still slack so the dog can sit or stand comfortably, but what he can’t to is jump. I’m stopping him from jumping, so he cant be reinforced for it, and behaviours which aren’t reinforced will go away. In this instance, I’d also combine reinforcing the wanted behaviour, four on the floor. this way the dog learns the jumping doesn’t work but four on the floor does. This can be done for dogs jumping on visitors. Have the dog on a leash when they come in. Calm behaviour allows access to visitors, excited, jumping behaviour doesn’t. If the dog is calm and you release her to say hello and she jumps, you take her back to where she doesn’t have access. Consistency is the key. Remember the rule of random pay off. 2. Barking and growling at kids, visitors, strangers, men, other dogs, cyclists, skateboards. Again, this is a general description based on your dog being fearful/anxious of these things. Give the dog enough distance that he feels safe (generally, the distance that he isn’t reacting). Give him tasty treats or throw a toy for him. Generally, what happens here is that your dog feels scared/anxious and has learned that barking/lunging/growling causes the scary thing to go away. The dog doesn’t realise that the scary thing is likely to go away anyway. What we want to do is keep the dog feeling safe and make him feel better about the scary thing. overtime, we can decrease the distance as the dog feels better about the scary thing. Another approach is to kong train your dog. Every time a visitor arrives, you give the dog a “super” kong filled with the best food. Allow the dog to take this where he wants. He will make the association of visitors coming in with the kong coming out. Make sure the visitor comes in first and don’t give this “super” kong any other time. 3. Attacking the mail. Management can solve this. An external post box means the dog can’t access the mail, can’t attack it, so can’t be reinforced. A basket which the mail falls into helps also. Sometimes the simplest solutions are the most easiest. Ian Dunbar tells a story of being asked how to stop a Yorkshire Terrier from messing on the bed by a woman at a seminar years ago. He asked her how long this had been going on, to which she told him “every day for 9 years”. He told her to shut the bedroom door. She was delighted. If we stop access to reinforcers, we stop behaviour. Management should always be our first step in training or behaviour modification. This is because it’s easy with some thought and imagination, least aversive for the dog, allows the dog to think, and therefor allows the dog to learn. If your dog is doing something you don’t like, think about what she is being reinforced with. The more we understand this, the more successful we will be and the more successful our relationship with our dog will be. I’ll address some problems with recall next week. Nothing in Life is Free (NILIF), Learn to Earn. You may be familiar with these terms. They were devised, probably by well intention people, to allow you to use what your dog routinely gets in his life as ways to train him. The other thing some NILIF advocates is that your dog is behaving in a poor manner because he has unlimited access to resources, is spoiled or thinks he’s the “boss” or you are not the “pack leader”. Now, some of what I say in this blog may seem contradictory as you read it, but it’s the reason why we are doing it, and the scientific reasons for it’s success/effectiveness which are important. 1. Classical conditioning – learning by association. 5. Positive/negative – adding(+)/subtracting(-) something from the dog’s environment. In training/learning, it doesn’t mean good or bad. We have positive and negative punishment and positve and negative reinforcement. Proper understanding of the terms is important, because it allows us to have a greater understanding of what we are doing during training and why we are doing it. So, to get back on topic. NILIF protocols advocate taking everything away from your dog if he isn’t behaving the way you want him to behave. The dog has no free access to food, toys or people for petting, playing etc. Further, every time your dog wants something, he has to earn it. You can’t just give your dog something, like a rub on the ear, just because he’s your pal and you want to. He has no access to toys he can play with himself, like chewing on a nylabone or kong, or playing with a squeaky plush toy to keep himself amused. Every morsel of food, every game you play with your dog, every time you want to pet her depends on her doing something you want her to do like sitting politely or coming when called. The NILIF protocol says that when you decide you want to, you give the dog all the good things, and don’t when you don’t want to. What can happen here, is that if owners can’t be bothered or don’t have the time to interact with their dogs, they now have permission not to. It further recommends that if your dog approaches you for attention, ignore him, but when he walks away, then call him back and pet him then. That way, you are dictating access to you, not the other way around. Now, if you haven’t already thought about this, this can lead to a very sad and frustrated dog. The day before you instigated this programme, your dog was fed regularly, had toys to play with, could come and say hi when he wanted to and you’d say hi back. Now his whole life has been changed, and as far as he’s concerned, not for the better and he can become depressed. The dog can also become demanding if this happens as he is trying desperately to get attention. The other side of this, is that we can do very similar things to NILIF, but for different reasons and obtain hugely different results. These are all training programmes I’ve learned from the best trainers in the world such as Ian Dunbar, Jean Donaldson, Ken Ramirez and Kathy Sdao, among many others. Your dog has to eat. Hopefully, you like going out for walks, playing with your dog and giving them attention and petting. Your dog likes, and needs, these things too. So let’s use them for training. This is where it does become different. 1. Your dog’s food – food is a primary reinforcer. So let’s use it to train our dog. It reinforces behaviour, so when your dog sits, give him a piece of kibble so he’s more likely to do it again. Take your dog’s food out on a walk with you. Sit on a park bench and every time a person or dog walks past, give him a piece of food. This way he learns dogs and people means food comes out which makes him feel good and with enough practice, dog’s and people approaching makes him feel good with there being no food present (classical conditioning) and you are reinforcing him for paying attention to you when people or dogs are around (operant conditioning using positive reinforcement). 2. Your dog’s toys. Let him play with his own toys. He has his, I have mine. Mine are a couple of balls on ropes and a tug toy. He gets to play with his by chewing on them, maybe throwing them in the air and catching them. I let him play with mine, but only when I’m there and there are rules attached, but mine are more fun, beacsue I’m involved in the play. My toys move, I throw throw them and I tug on them. She gets to chase them and tug on them back. The rules are be careful with your teeth, and give them back when I ask you to. I don’t play with my dog’s toys but I do allow her to play with mine, because they are fun (for both of us) and because I can train her when playing. Your dog enjoys playing tug or chasing a ball, you play tug or throw the ball, your dog will now enjoy playing with you (classical conditioning). You give your dog a game of tug or throw the ball when they come back to you you are now using positive reinforcement to train a recall. There’s also loads you can do for free for your dog which is still training your dog and classically conditioning you to him in a beneficial way. Playing long games of tug in the garden with your dog, for no reason other than having fun, classically conditions your dog that you are a great, fun guy to be around, Further to that, now when you give your dog a short game of tug after a recall or a down stay, he has that long history of big tug games to refer to and it is much more powerful. Similarly, petting your dog for 40 minutes in the evening when you are sitting reading or watching TV means that clapping your dog when he does something you like now has more meaning. One of the main differences between this approach and NILIF is that it doesn’t give you permission to do nothing. Your dog needs daily exercise and stimulation for a full life. The more we use our dogs food and play and attention for training, the better trained our dog will be. If you use a quarter of your dogs food for training, rather than all of it, you will only get a quarter of the benefit. That said, you don’t need to hand feed it all, put what you don’t use in a Kong or other stuffable toy and you are now teaching your dog to entertain herself, chew an appropriate item and be calm. The minimum we can do with this, if we’re motivated to is to give all daily food in toys or food puzzles so you are at least getting that benefit from it. A programme like this leads to a well trained, sociable dog, and a truly deep relationship with you.